Omni is as its name implies, a multi-purpose spectrometer with flexible counter arrangements which accepts most inserts, transverse or axial. 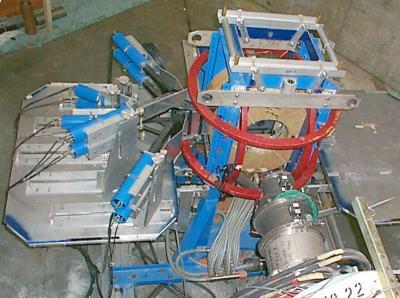 It was the first spectrometer at TRIUMF to have its main Helmholtz coil oriented longitudinally, taking advantage of spin rotators on M15 and M20. It also has lighter coils in the two other directions, and an axial shim coil, with a convenient pivoting bus bar to switch the main power supply to any of the three directions. The main coils are separated by a 5.25-inch gap. Over the years, Omni has undergone several changes to its counter mounting system, and now features µSR facility standard tables and THK tracks on which the counter (and side-access cryostat) ride. Less appealing are the changes to its main magnets. Originally, Omni gave 4 kG (0.4T) at 750A, but one of its main coils short-circuited, and a new pair was purchased, leaving one (original) spare coil. A new coil short-circuited soon thereafter, but the spare seems to have vanished, so at present, Omni provides 3 kG (0.3T) at 750A. or 4 G/A.